Check out the GT8 Truck Versions!! Worried about meeting the Tier 4 engine requirements ?? Consider a PTO driven GT8 – we are installing our drills on 2019 and 2020 trucks with Tier 4 engines – no need to worry about a Tier 4 deck engines! GT8– Max Coming in May! 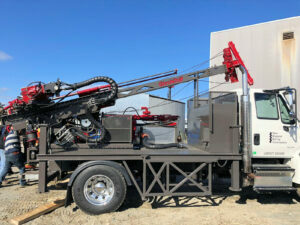 Truck Mounted GT8 with High Torque Head ( 12,000 ftlb), Long Feed Stroke ( 11 ft), Telescoping Crown Block, and many other new Features – PTO Driven off of a 33,000 GVW Truck – Check it out in May. « Remember When Contest ! !